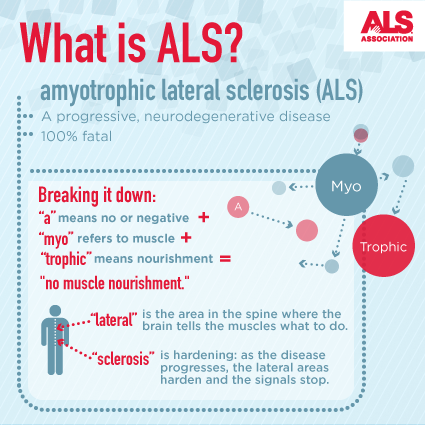 The information below was excerpted from ALS.org. Over the coming months our intent is to develop a resource page specific to the Hawaiian Islands. Stay tuned. Recent years have brought a wealth of new scientific understanding regarding the physiology of this disease. There is currently one FDA approved drug, riluzole, that modestly slows the progression of ALS in some people. Although there is not yet a cure or treatment that halts or reverses ALS, scientists have made significant progress in learning more about this disease. In addition, people with ALS may experience a better quality of life in living with the disease by participating in support groups, for information on Kauai ALS support groups contact Terryn Davis, OTR, of the ALS Association Golden West Chapter: (808) 597-6416 or tdavis@alsagoldenwest.org. Consider attending ALS Association Certified Treatment Center of Excellence or a Recognized Treatment Center, which provide a national standard of best-practice multidisciplinary care to help manage the symptoms of the disease and assist people living with ALS to maintain as much independence as possible for as long as possible. According to the American Academy of Neurology’s Practice Paramater Update, studies have shown that participation in a multidisciplinary ALS clinic may prolong survival and improve quality of life. To find a Center near you, visit http://www.alsa.org/community/certified-centers/.